Jack Rabbit Vapes eliquid is made in the UK. These 50ml shortfills feature layered fruit and dessert flavours. Succulent Strawberry eliquid and Banoffee Pie eliquid are available in a 70% VG blend, making them best suited for sub ohm vape tanks. 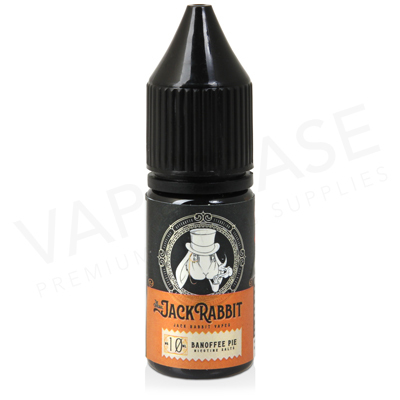 Each Jack Rabbit shortfill has room for the 10ml nicotine booster shot of your choice. Jack Rabbit Salts are manufactured in the UK, delivering a range of their classic flavours in a salt nicotine format. Available in 10ml bottles, with a 50% VG ratio, ideally suited to use with a pod device or starter kit. These eliquids contain Salt Nicotine. When vaped you'll experience a smoother throat hit compared to standard eliquids.